Well, last weekend I spend my time with my siblings. We go Balik Kampung. My aunt buat Doa Selamat at her house at Tapah, so we just go there and gather with others family members! Meriah as always. Syukur Alhamdulillah everything went well. We arrived at Tapah at dawn and that time you know lah how the lighting is and that explains why the picture look "dawn kinda effect". Hahahaa.. The actual picture are darker than this okeh, Hahahaa.. I tried my best to show up the color of my outfit. 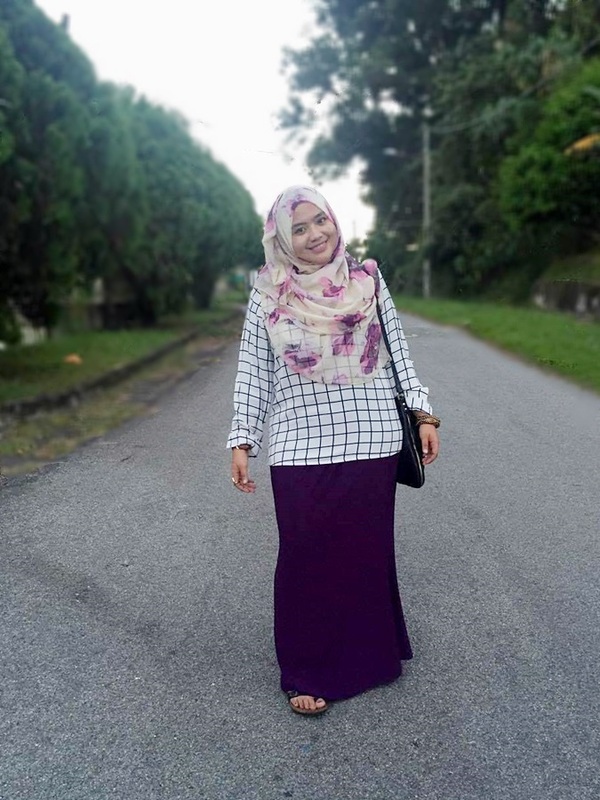 Well, since I berdegil jugak nak snap outfit I that time cause I think I wear a proper hijabers look. 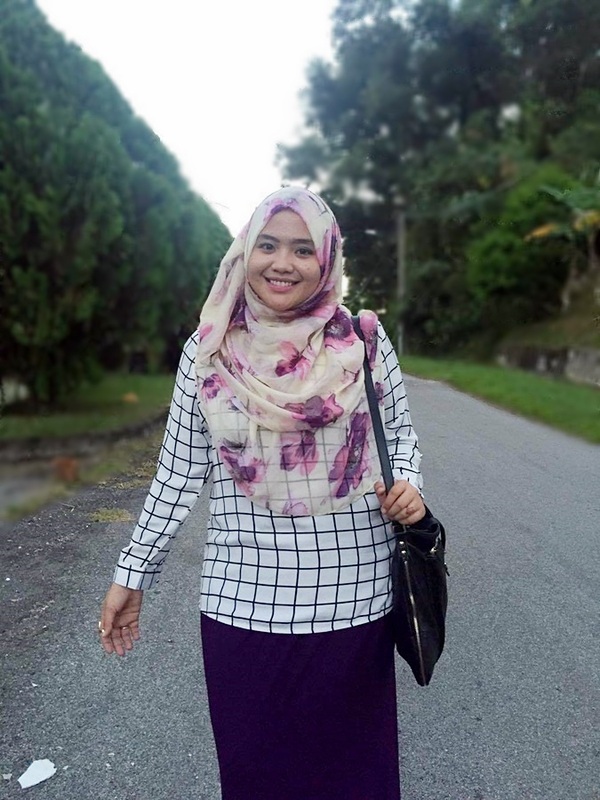 I think lahh.. Hahahaa.. Just simply match my grid white blouse with dark purple skirt and compliment the look by using my floral scarf! I think it is a great combination tho. I rarely choose white for my outfit because it is easily get dusty and dirt. Rather than that it also make you a little bit "plum" and as know big! so that is the reason why I don't choose white but now I think I have to take some risk and have to put the white outfit . Be confident with what I can wear. Before officially put my actual "white dress" ehemmm.. hahahhaa.. Lambat lagi. Okeh stop bebel. Here my outfit that time. I need your opinion lah guys! Please help me. 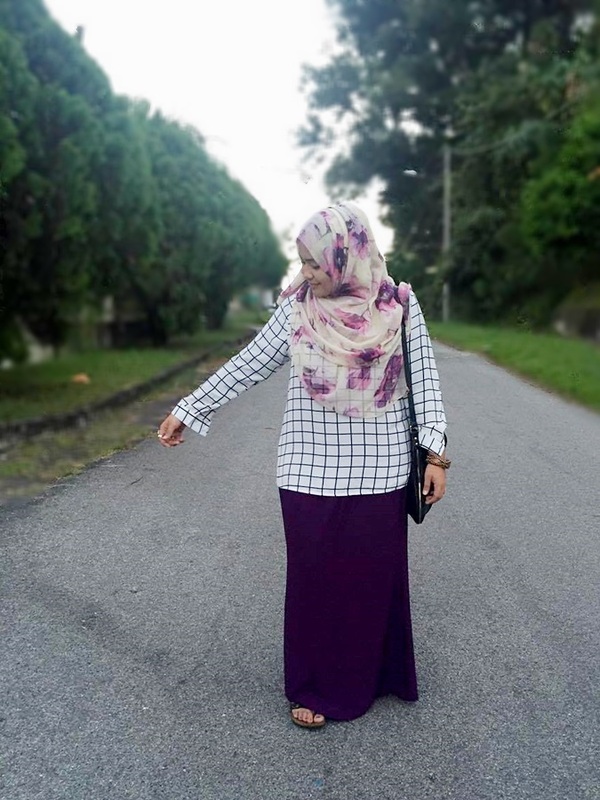 What do you think of my OUTFIT POST? Do I need to add more or make any changes? Let me know yahh.. Anything that I can add on to this post. I will try my best to improve everything. Therefore, I need your opinion. Just say the words out loud, I try my best untuk hadam.. Hihihiii..